Jack Russell Terrier Pictures from all over the World! 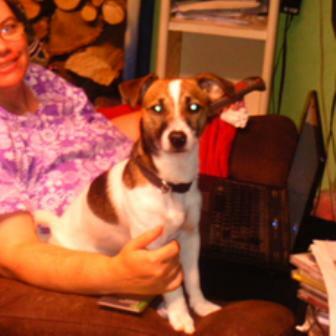 Welcome to our reader submitted Jack Russell Terrier Pictures. 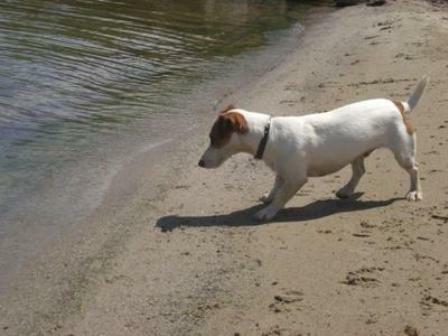 Please take a few mintues to enjoy these Jack Russell Pics and stories. To join in on the fun just submit your photos and a story about your Jack here. You might want to bookmark this page as 23 will be adding and updating new and great Jack Russell Terrier pictures all the time. And please I need more and more pictures of Little Jacks. Dig some out or take some new ones and get them to me asap! Would you like to see your own favorite Jack Russell pictures featured here? Great! Just send me your photo and I'll love making your dog available to Jack Russell lovers all over the world! Would love to get some pictures of Jack Russells with barnyard animals, or with children. You can upload your photos by filling about the form you can find on this page here. "Occy was born on July 19 2008. He adopted me when he was 8 weeks old. Prior to Occy, I had Cassegrain, and Laddie, sadly Laddie passed away a few days after Occy was born. He was almost 18 years old. When Occy joined the family, Cassegrain (14 years old), my other dog, mothered him for a while as you can see in one of the photos. She disciplines him when he is naughty. She loves him and he loves her. They love their long walks everyday on the beach. Occy loves digging up my garden and chasing anything that moves. 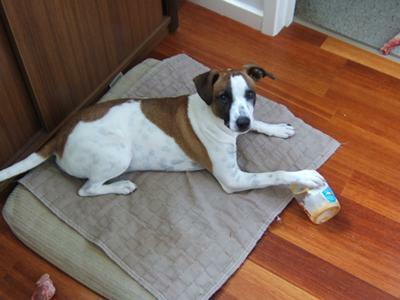 Occy loves people and plays well with other dogs in the neighbourhood. He sees the world outside the front gate as a huge amusement park and loves to explore, I always keep him on his leash when I'm outside my house. Like any dog lover, I think he is my little champ." Thank you for the awesome pictures Cliff! This is are puppy named Autee he is very loving and likes to give kisses and hugs and barks at my husband. He likes to hide his bones. He is well trained and he scratches the door when he wants to go out for pee. Thanks for sharing Cindy. I'm so glad your Jack is bringing your family such great joy. Bosco is 2 year old Jack Russell Mix. (his mom is 1/2 chihuahua.) He's a crazy little man who give me lots of excersize! I got him from a girl who didn't know what she was getting into when she got a JRT and was going to send him to the pound. I was only suppose to have him for a few weeks until he found another home but, I fell in love with him and decided to keep him! Bosco at the beach, unsure of the waves! I love taking pictures of my dog Annie...with doggy clothes on! And because she hates it, that's actually what makes for such a good shot! People love seeing dogs in clothes and so do I. 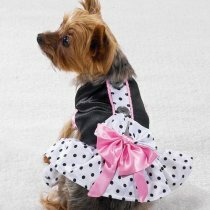 With the latest fashions for getting your Jack Russell dog all dolled up! 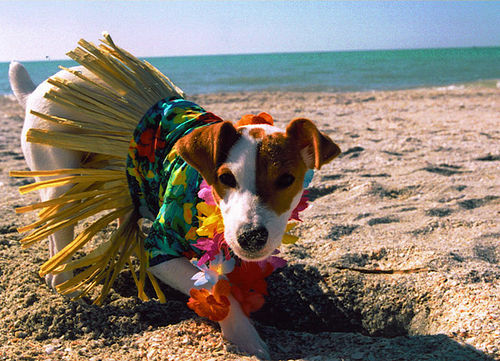 I need more Jack Russell Terrier pictures of dogs in doggy clothes to present here at Pics & Tics. I'm trying to get some pictures of my Annie together to feature here. Why don't you send me yours too. Ok? Have Pictures and A Great Story About Your Jack Russell? 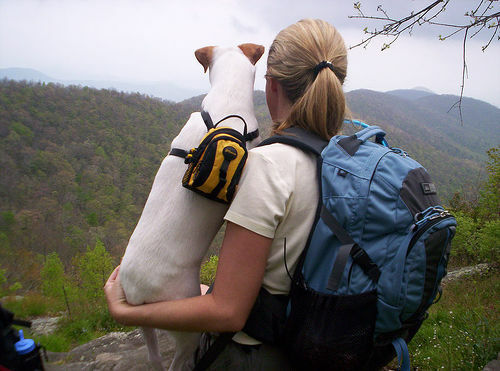 Do you have pictures and a great story about your Jack Russell or Jack Russell Mix? Share it for us for all to enjoy by entering your Jack Russell stories and uploading your pictures below. If you have more than 4 pictures, just use the same form a second time. Entering your story sending us your pictures is easy to do. Your story and pictures will appear on a Web page exactly the way you enter it here. You can wrap a word in square brackets to make it appear bold. For example [my story] would show as my story on the Web page containing your story. or submit this form a second time (preferred) indicating that it is a second set of pictures. Jack's Always Have a Smile for You! My best buddy of 14 years. The kindest, most patient, loving, smart individual I had the privilege of knowing and spending time with. Rosie is a Black and Tan JRT, who loves canal boating and is obsessed with squeaky tennis balls. She is my princess, and I love everything about her. My dog just went on a run and now he's panting and looking super happy!!!! If you prefer, feel free to email us here. Don't stop now! There's more pages and lots more Jack Russell Terrier pictures and slide shows.